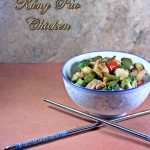 Kung Pao Chicken is a simple and quick chicken stir fry recipe. It's packed with flavour but remarkably easy to make. In a bowl combine the chicken, half the soy sauce, and the corn starch. Mix well, and marinate for 10 minutes. Heat up a wok, or frying pan over high heat. Add the oil and the chicken. Spread the chicken over the base of the pan evenly so it cooks all the pieces. Let each side brown well, about 4 or so minutes each side. Add the garlic, peanuts and veggies and cook until the veggies soften and the chicken is tender and cooked through. Should take about 4 or 5 minutes depending on the heat of your pan. Add the stock, sauce and vinegar and cook for another 2 or so minutes. Serve over rice if desired. I used jasmine with it and it was lovely. Original recipe belongs to Steamy Kitchen. You can find her Kung Pao Chicken recipe on Recipe Girl's site.